Michael Keeps Them Coming In with The Medusa Plot and Amulet 4. The most anxiously awaited book of the year is finally here! The Vespers are a secret family that has been after the master serum for decades. But the Vespers aren't all related. They hire people to do their dirty work. So no Cahill is truly safe. The Vespers kidnap Fiske Cahill, Nellie Gomez, Reagan Holt, Natalie Kabra, Ted Starling, Alistair Oh, and Pheonix Wizard. Amy and Dan, having narrowly avoid kidnapping themselves, are recieving myterious mesages from Vesper One. They must do what he says and steal the famous painting "Medusa", or one of the kidnapped Cahills will be killed. Can Amy and Dan do it in time? Will the branches cooperate? And who is Vesper One? This new book is brilliantly written with more than five thriller scenes. Introducing new characters Pheonix and Leila Wizard and Evan Tolliver, this book is truly an instant classic that no one should miss out on! And be sure to look for book 2 in December: A King's Ransom by Jude Watson. And don't miss the epic movie saga starting in 2014! Finally Emma has arrived in Ceilis, home of the Guardian Council. Now all she has to do is warn them of the elf king, and everything will be fixed, right? Not so easy. Emma must undergo a series of tests put on by the Guardian Council against other stonekeepers. The strongest will survive, the weakest will die. It's possible for all the competitors to survive, but it's also possible that none should make it. And if the stonekeepers pass the tests, the reward will be far greater than any of them could imagine. Introducing new characters Ally, Vigo Light, Cecil, and Dagno, and featuring the return of Miskit and Cogsley, this book is beautifully illustrated and has incredible action and drama. So don't miss out on this one-of-a-kind graphic novel! And I've never read any of the Amulet graphic novels but you made me really curious now! May have to go and check them out. Thanks again. Be sure to go and get these books, guys! You've heard from another reader guy (as well as the Iron Guy) just how good they are! We Interrupt This Weekend to Bring You a GOLIATH-Sized Announcement! YIPPEE and YAHOO!! Or, I should say, Barking Spiders!! Am I ever excited!! The final book in the Leviathan trilogy has just arrived. 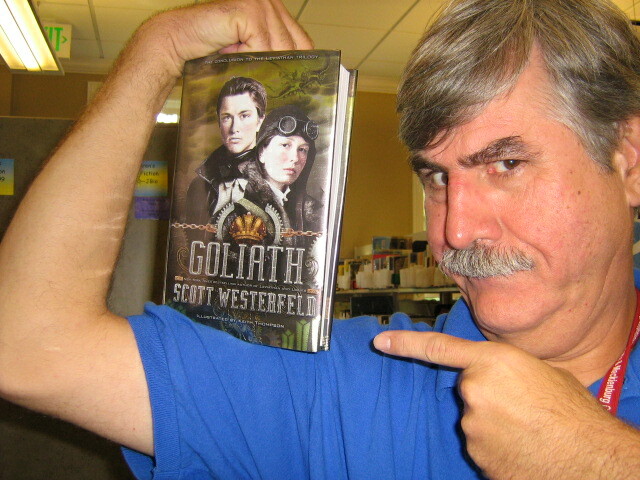 It's Goliath by Scott Westerfeld a nd I've been waiting a long time for this. If you haven't read Leviathan or Behemoth, stop wasting time and go get them now. Macht Snell!! as the Clankers would say. Boy, oh, boy, I know what I'll be doing this weekend!! The two boys came out of the portal almost as fast as they had fallen in. They were immediately flying through a clear blue sky. It looked like they had nothing to fear; the portal only lead outside. Yes, that’s what it looked like. Almost without warning, Ben and Jack left the sky and fell through a forest of pine trees. Ben came out of the trees first. The trees had slowed his fall so that he wasn’t seriously hurt, but he still felt pain. Then Jack landed directly on top of him. “AH!” Ben screamed, more pain coming through. After recuperating, the two boys got up and looked around. They were in a forest, all right, but it looked just like Earth. There were no forests anywhere near where Ben and Jack lived. Where were they? Just then, two small objects came falling through the trees. The two boys examined them. “Put this in your ear,” both objects said in synchronization. The two boys did so. “I think things are in order for an explanation here, Jen,” said Ben. The boys pondered this. Would Ellie and Jennifer make up a tale like this just to get the boys off their case? “How do you know?” Ben asked. Pretty good, Michael! Can't wait to find out what happens next! There's action and laughs here--just what every reader guy wants! BTW, do you all know that Michael is the second guy to send us a preview of a book? That's right--another reader and writer guy (who calls himself Dark Omen) sent us a copy back in November. Check out that post here. This is great!! Keep those reviews and surprises coming! A New Friend Tells Us About a Truly Terrific Book! I'm always excited when a new reader guy sends us a review and today a new friend, mathfan, has written to us for the very first time. He's going to tell us about a book that I really enjoyed. Let's hear it, mathfan! Imagine flying horses, goat men, and horsemen hovering around your cabin as you came out for breakfast. This is what it would feel like to be in the Lost Hero. Through my many years of reading, I have enjoyed many books, but the Lost Hero by Rick Riordan stands out. The nail-biting fast-paced action, in-depth details, and the hints of Greek Mythology in Rick Riordan’s The Lost Hero impresses me immensely. The action is spread out all over the book; for example, Jason (the main character) and the sky-spirit Dylan battle it out in hand-to-hand combat. Another instance occurs when Jason impulsively jumps off of the edge of the skywalk to go save Piper, who falls off by mistake. When Jason jumps, he finds out his amazing power of being able to fly. Given the fact that the book involves Greek gods, centaurs (horse people), and satyrs (goat people), I am instantaneously fascinated. Also, the really in-depth details bring these characters to life. For example, let’s describe the satyr. The satyr is half goat and half human. If you have friends who have really long hair (to cover their horns), always wear pants (to cover their goat legs), and eats cans and tin foil, you are likely to have a satyr on your hands. I like those characters because I am fascinated with Greek Mythology. Another aspect of the book that I am fascinated about is the fiction and fantasy and that it is not like a boring history textbook. Rick Riordan is able to also push the limits by making fantasy sound like reality. For example, the setting of Camp Half-Blood may seem like a fantasy if someone else describes it, but the author makes the place seem like home. Camp Half-Blood is full of people in different cabins and is full of weird goat people. The Apollo Cabin practices archery and the Hephaestus cabin makes a celestial bronze sword. Jason thinks, “There is no way I can fit in here.” But he just has to wait and see. This is how the fiction and fantasy affects the book. Having always enjoyed reading Rick Riordan’s books, I know that he is always going to be in the Hall Of Fame for writers. As you climb back into bed, overwhelmed with the sights, you now know all about the animals that live on the made-up land, of The Lost Hero. Thanks, mathfan! I've always enjoyed Rick Riordan's books too and The Lost Hero is indeed full of "nail-biting fast-action." AND---did you know the next book in the series comes out soon? Like on October 4? Like in only fifteen days?? It's called The Son of Neptune and I can't wait!! And did you know you can read the first chapter online? You can go to the Heroes of Olympus website and click on the Sneak Peek icon. (although I had trouble getting it to work today) You can go the library's website at www.cmlibrary.org and reserve your copy if you live in the Charlotte/Mecklenburg county area. Or visit your local library or bookstore if you're out of town. Either way, be sure to get The Son of Neptune. From what I've read of the Sneak Peek, this one will be every bit as good as The Lost Hero. Thanks, again, mathfan! I enjoyed your review. Let us hear from you again soon. Michael Tells Us About a Couple of Winners! With the notorious gangster Kevin Gilhooley in the brig of the Titanic, Paddy Burns is finally safe... or is he? He and Alfie have found a mysterious notebook belonging to a murderer from long ago. Is he onboard the ship? Alfie has his prime suspect: a grumpy old man with two lame legs. All the clues point to him, but could he really be a ruthless killer? Sophie and Julianna get caught up in the mystery too, plus, there are rumors about the ship of approaching ice glaciers. Is it true? Is the old man a murderer? And, most importantly, just how safe is the unsinkable Titanic? Gordan Korman takes his writing to new heights with incredible true facts and shocking twists and turns. You won't want to miss out on this exciting read! Also, look out for book 3: S. O. S.
Jonah and Katherine are trapped in time again. Only this time, they have no contact with JB, no helpful gadgets, and worst of all, no tracers! They've all disappeared! The two are trapped in 1611 aboard Henry Hudson's ship. But after the tracers disappear, things aren't as they seem. Hudson was supposed to be left in a rowvoat at sea, but instead, his ship came back for him! Plus, he's looking for the Northwest Passage, which doesn't exist, but suddenly, it appears out of nowhere! And one of the crew members on board isn't what he appears to be... or, more accurately, he isn't who he appears to be. How are Jonah and Katherine supposed to get time back on track? How can they survive on the ship? And how can they save JB and the rest of their friends who are still trapped in 1611? You can never guess what will happen next in Haddix's new masterpiece, plus, she goes even deeper in exploring new aspects of time. If you haven't read The Missing, you're surely missing out on one of today's greatest classics! Thanks, Michael! You always find the best books. And you always make me want to read them! I read the first book in the Found series but haven't gotten around to the others. You really made me want to read this one. I'm also a big fan of Gordon Korman's Island trilogy. (If you want to find find out what we've written about Found or the Island trilogy or those two authors, click on the Labels section under this post) Well, back to checking out more books to our friends. 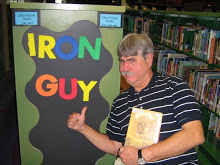 Stand back, everybody--the Iron Guy can check out books only at supersonic speed, not light speed!